Grace Siregar settles into Sumatra’s first city. At the end of March 2006 my husband Alexander’s contract with an NGO based in Tobelo, North Maluku, came to an end and he received an offer of a new position with the same organisation in Meulaboh, Aceh. I was delighted to hear this news and began to imagine that I would repeat in Meulaboh what I had done in North Maluku, supporting the local arts scene and setting up strong networks and grass-roots arts organisations. This was to remain a dream, as it turned out that Alexander’s position was an “unaccompanied” post. We decided that our daughter Rachel and I would be based in Medan, while Alexander would commute from Medan to Meulaboh each week. None of us were really happy with this new arrangement as this would be the first time that the family would be split between two locations and, basically, we enjoy each other’s company! However, it seemed the best balance that we could find within this new reality. During the week leading up to our departure from Tobelo, Rachel cried almost every day as the reality hit of how much she would miss all her friends, her teachers and Efi-Efi primary school just outside Tobelo, all of which she loved so dearly. The incredible Halmahera landscape, too, we knew would tug on our heartstrings: the beaches, the myriad little islands and the magnificent views of ocean and volcanoes that had already become a part of our daily lives. Alexander and I took turns reassuring Rachel that we would definitely come back to North Maluku so that she could play with her friends again and visit her school. In reality, we both felt exactly the same as her and were not looking forward to wrenching ourselves loose of all the friends and colleagues or of the work we had both done for the wonderful two years and three months we had spent in Ternate and Tobelo. During the first few days the city succeeded in constantly surprising me. 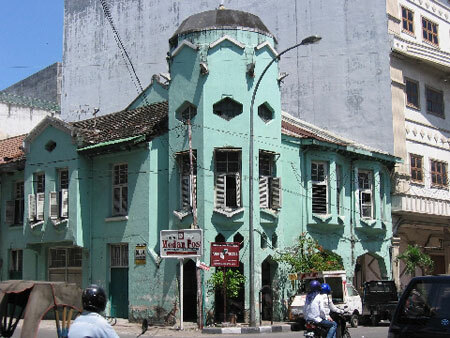 Medan, whether by design or accident, still contains a lot of great Dutch colonial buildings. ‘Old money’ neighbourhoods like Jalan Sudirman and Polonia with their decaying Dutch villas; Kampung Keling with its strong Indian flavour; Medan Baru with its long straight streets full of East Indies civil servants’ houses, and the formerly elite shopping street of Kesawan, have all been there since Medan’s heyday as the Dutch rubber capital. What made me quickly lose my heart to Medan was its diversity. 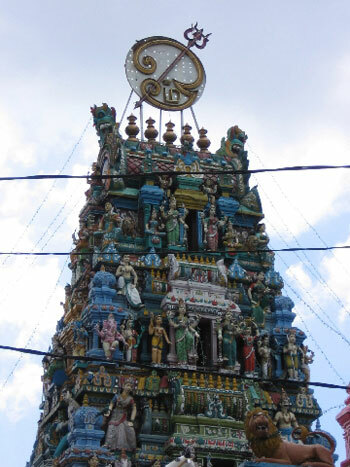 I love Kampung Keling with its wonderful Indian food, multi-coloured Hindu temple and multi-ethnic population, dominated by the Tamils who have lived their as long as anyone can remember. 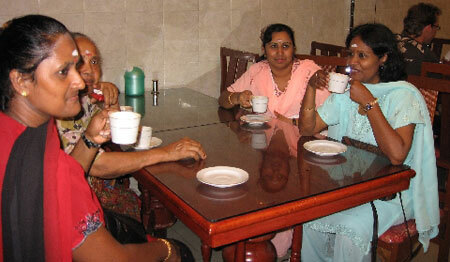 South Indian ladies of Medan. Alongside those descended from one of South India’s largest ethnicities, live Bataks, Malays, Minangs, Hokkien Chinese, Javanese, Acehnese, Nias and many others. To my constant amusement, the population of Medan, regardless of ethnic background, speaks Indonesian with a strong Batak accent. I still can’t quite get over the experience of seeing Indians, Javanese and Chinese alike engaged in animated conversations in what I have always thought of as a dialect specific to my own ethnic group. Then, from the local dialect, to the multitude of languages to be heard on the streets and around every corner: Hakka and Hokkien, Tamil, Sindhi and Punjabi, the Toba, Karo, Simalungun,and Dairi variants of the Batak language, as well as the Malays speaking the Deli Malay on which Bahasa Indonesia was built. There is also a miscellany of religions to add to the mix: Christianity (Protestant, Catholic and Orthodox), Islam, Hinduism, Buddhism, Sikhism and Confucianism. All varieties of places of worship: for instance a Lutheran HKBP church, a Mosque, and the Gunung Timur Buddhist temple all amicably rub shoulders on Jalan Cik Di Tiro in Madras Hulu neighbourhood close to Kampung Keling. The smell of Confucianist, Buddhist, Catholic, Orthodox and Hindu incense mingles with the alluring aromas of dosai, naan and samosas from the Indian restaurants. I had already been told by friends that Medan offered a food bonanza and they weren’t wrong! So far I have enjoyed Toba and Karo Batak lapo (eating houses), as well as Chinese, Indian, Minang Kabouw, Malay and Acehnese delicacies. Medan is a city where you can tour the world and its cuisines on a daily rotation! Grace Siregar is an artist based in Medan, Sumatra, where she runs Tondi Gallery, an art space for fresh and innovative contemporary arts.